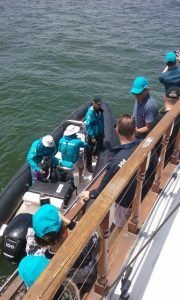 While investigating how to view the start of leg 4 of the Volvo Ocean race, ATPI sports made a priceless discovery. Hidden among the charter boat fleet in Docklands was an ancient seagoing vessel – A Chinese junk aptly named The Oriental Queen. A far cry from the multi-million dollar racing yachts participating in the race, yet equally intriguing. Ordinarily, on a Saturday in Melbourne, the Oriental Queen would be chartered for private parties and boat parties on Melbourne’s waterways. On the 2nd of January ATPI sports chartered her to take advantage of her huge cabin space and 360 degree views from the main cabin in order to host the family and friends of team AkzoNobel. Chinese junks (ships) were first used in the 2nd Century and developed largely by the Song Dynasty from 960 AD to 1279 AD it was considered one of the most suitable vessels for transport and commerce due to its efficient and stable design. At full sail a junk is fast and easily controlled with sails easily rigged inward toward the long axis of the ship. A high centre of gravity similar to modern recreational craft like catamarans and windsurfers translates to performance from low tech materials. A thousand years ago the Oriental Queen would have been defined as cutting edge to able to sail across the oceans. Today it should be honoured among its modern-day counterparts. Being optimistic and confident in their victory before the big race opening in Alicante in October last year, AkzoNobel had expressed the aim of winning the Volvo Ocean Race safely and sustainably. However the harsh Southern Leg from Cape Town to Melbourne damaged the boat and stalled progress. 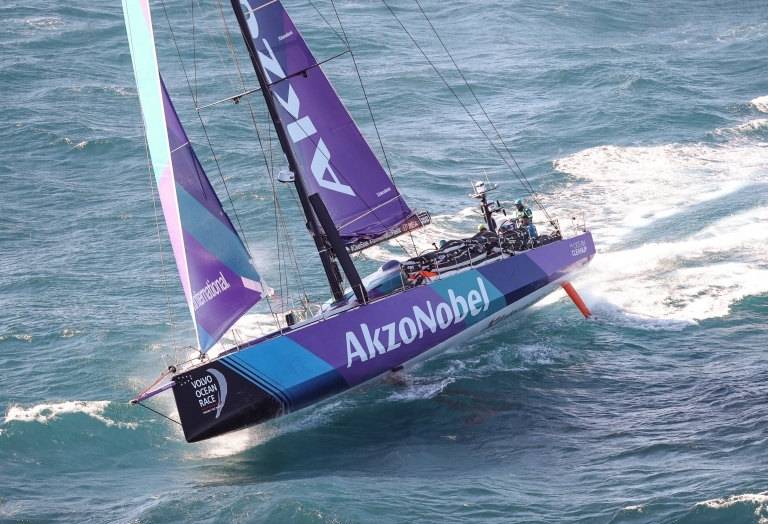 Consequently, team AkzoNobel arrived in Melbourne days after the rest of the fleet which was headed by team MAPFRE. Since 1973 the Volvo Ocean Race has challenged the world’s best sailors across the toughest waters. Often described as the longest and hardest professional sporting event in the world and sailing’s toughest team challenge, the traditional yacht race attracts adventurous and ambitious sailors from all over the world every three years. This year’s edition is taking the teams 45,000 nautical miles around the globe, across four oceans, touching six continents and 12 landmark Host Cities, including for example Alicante (Spain), Cape Town (South Africa), Guangzhou (China), Itajaí (Brazil) and The Hague (The Netherlands). For the first time since 2005/06, the famous race returned to Melbourne. 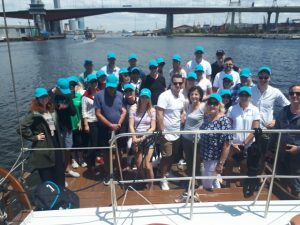 Also for the first time team AkzoNobel joined the race, witnessed by their family and friends aboard the Oriental Queen for a race boat party Melbourne style as chartered by ATPI sports. The Dutch multinational company creates leading performance coatings, paints and specialty chemicals for both, industry and consumers worldwide. With well-known brands as ‘Dulux’, ‘International’ and ‘Interpon’ their aim is to make people’s lives more liveable and inspiring. With this vision in mind, Team AkzoNobel announced in July last year, its participation in this year’s Volvo Ocean Race edition as part of a strategic partnership to raise global awareness for the company’s brands and expertise as well as to create opportunities to engage in projects with local communities. As a sustainable partner and the official Boatyard supplier for the 2017-18 Volvo Ocean Race, they also coated all the boats competing in this year’s edition with their unique products. What a good way to showcase the high quality of their coatings since the 2017-2018 route visits some of the most outlying and inhospitable areas of the world’s oceans, and the boats and sailors thus have to deal with an extreme range of weather conditions, from ice-cold and raging storms to sweltering heat. As this wasn’t challenging enough, AkzoNobel has developed unique custom colours for every team in order to showcase its professionality and expertise to a giant global audience. With a distinctive purple and blue sail, the international Team AkzoNobel, composed of the Dutch skipper Simeon Tienpont and eight experienced sailors from seven nations, has already mastered three legs and is now on its way to Hong Kong after spending a festive rest period in Melbourne. But that’s no reason for AkzoNobel to surrender! While other teams spent their rest period with Christmas hampers and Boxing Day Shopping in Melbourne, the hardworking and driven crew of AkzoNobel repaired the boat damage and prepared themselves for Leg 4 to Hong Kong, which hosts the Volvo Ocean Race for the first time in history and ironically is the original home of the beloved Oriental Queen. Every reason for families, friends and colleagues of team AkzoNobel to rise up and support the unrelenting crew for leg 4 at their function for this occasion on board the Oriental Queen! Originally built in Hong Kong, the Oriental Queen is the perfect location for this event. With its combination of tradition and luxury, the 17 metre (57 foot) vessel didn’t have to hide as the sportive yachts entered the shores of Melbourne. The Queen was built entirely of teak and has since been renovated with rich timbers and luxurious fabrics. So the AkzoNobel staff and their families enjoyed their function at a venue evenly matched to the world’s premier offshore sailing race and the company’s proud maritime heritage. From Docklands out to Port Phillip Bay, the cruise delivered a unique experience for the 42 guests who enjoyed the Queens classy and stylish event space. Thanks to the Oriental Queen’s featured state of the art sound system and her licensed, fully stocked bar, there was nothing left to be desired. Having delicious food and drinks served on board and catered for by the Atlantic Group, AkzoNobel celebrated and extended the festive Christmas/New Year’s season. With a professional event management team at ATPI sports and an experienced skipper and crew, all organisational issues were seamlessly managed while the group enjoyed the race, hospitality and each other while cheering for team AkzoNobel! Sounds Amazing? If you also have an idea for a unique event in mind and want to charter the beautiful Oriental Queen, please see details at http://www.orientalqueencruises.com.au/. With a huge range of boat cruise options, the Oriental Queen is the ultimate adventure or event space for any celebration. All of the 2017-18 Volvo Ocean Race teams will still need a lot of endurance and fan support as there are 7 legs yet to come. The current Leg 4 will challenge the sailors with a length of 5,600 nautical miles, up the north-east coast of Australia with its navigational challenges including large, the doldrums and potentially high winds. But 7 upcoming legs mean 7 more opportunities for team AkzoNobel to make up lost ground! If you want to stay up to date and see how they and all the other teams are doing, please visit Volvo Ocean Race to view the race’s live tracker 24/7. We keep our fingers crossed and wish all the teams good luck for the finish line in The Hague, where the fleet is estimated to arrive on 24th June this year.